The Cassini spacecraft is conducting a fly-by pass of Titan on Monday, a pass that will involve two major science observations. Known as the “T-118” Titan encounter, two Cassini instruments are being employed to sniff and observe the moon’s atmosphere before beaming the information back to Earth for evaluation by scientists. The Cassini mission continues to provide invaluable scientific data as it heads into its 19th year in space. The spacecraft was launched in October 1997 by a Titan IVB/Centaur, prior to a lengthy journey towards Saturn. It finally entered orbit in 2004 – following flybys of Earth, Venus, and Jupiter. The first major milestone for the mission came in December of that year, when its passenger spacecraft, Huygens, separated from the orbiter and reached Titan the following month. The spacecraft then entered Titan’s atmosphere and descended to the surface, marking the first landing ever accomplished in the outer Solar System. Cassini has gone on to collect a huge amount of new discoveries in the Saturnian system, most recently completing a dive through the ice plume ejecta material of the Saturnian moon Enceladus. The dive, designed to collect data about the mysterious subterranean salt water ocean on Enceladus, took Cassini on its deepest dive ever into the mysterious plumes of the ice moon. Cassini has now focused on Titan and recently spotted the tallest peak – that the spacecraft is able to observe with its radar instrumentation – on the moon. However, the spacecraft then prepared to get up close and personal with Titan, firing its main engine for a 45-second burn on March 25. 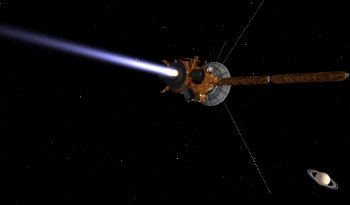 The burn slowed Cassini just enough to alter its orbit in preparation for the fly-by. As the spacecraft closed in on Titan, it rotated to points its instrumentation into the correct positions for two major science observations as it passed just 615 miles above the moon’s surface. 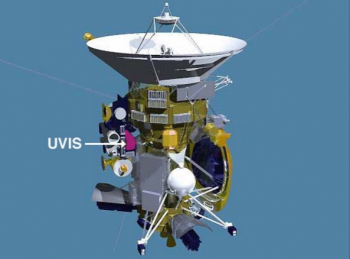 “Cassini’s cameras look in one direction; some of the spacecraft’s particle detectors look in another,” noted NASA ahead of the event. “This encounter features a complex, joint observation by two instruments. UVIS is a box of four telescopes that can see Ultraviolet (UV) light over wavelengths from 55.8 to 190 nanometers. This instrument is also a valuable tool to help determine the composition, distribution, aerosol particle content and temperatures of their atmospheres. 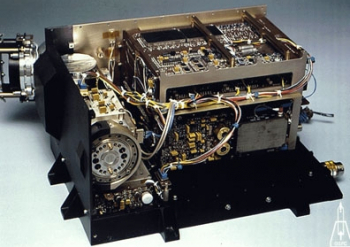 UVIS includes a two-channel, far- and extreme-ultraviolet imaging spectrograph that studies light over wavelengths from 55.8 to 190 nanometers. During the Titan pass, UVIS is tasked with taking samples by observing a solar occultation. Meanwhile, INMS will sample the upper atmospheric density directly. INMS is used to collect data to determine the composition and structure of positive ions and neutral particles in the upper atmosphere of Titan. The instrument is capable of determining the chemical, elemental and isotopic composition of the gaseous and volatile components of the neutral particles and the low energy ions in Titan’s atmosphere and ionosphere. Titan’s upper atmosphere is an active place where methane molecules are being broken apart by solar ultraviolet light and the byproducts combine to form compounds like ethane and acetylene. Data from the pass will hopefully provide scientists with new insights about the density and composition of Titan’s atmosphere. Cassini’s successful mission is heading towards its final year, itself part of an extension known as the “Solstice Mission”. Cassini’s fate involves controlled descent into Saturn’s atmosphere in September 2017.